NEW YORK / TORONTO (September 29, 2010) – Hockey Fights Cancer Awareness Month will once again share the spotlight in October with the start of the 2010-11 NHL season. For this season’s month-long initiative, the National Hockey League (NHL) and the National Hockey League Players’ Association (NHLPA) have partnered with The Leukemia & Lymphoma Society, Prostate Cancer Canada, ZERO - The Project to End Prostate Cancer and the Pancreatic Cancer Action Network to raise funds and awareness for this important cause. The NHL and the NHLPA will distribute more than $475,000 in grants to these four organizations as well as local cancer charities in all 30 NHL markets. 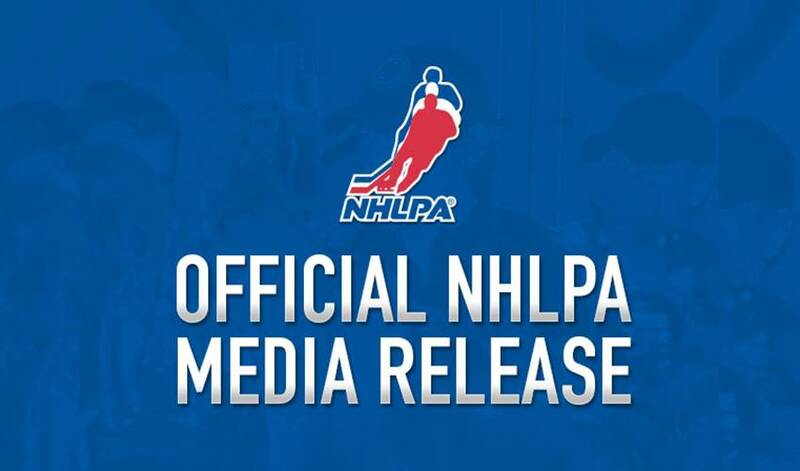 For the 13th straight year, the NHL and the NHLPA will mobilize the entire hockey community in hopes of exceeding the $650,000 raised as part of last year’s efforts. Hockey Fights Cancer will donate to The Leukemia & Lymphoma Society to fund a Pediatric Research Grant. Hockey Fights Cancer’s grant to Prostate Cancer Canada will establish a fund to support the needs of Canadian men fighting the disease. ZERO - The Project to End Prostate Cancer will use its donation to provide free on-board testing in select markets and fund several grants to medical centers and hospitals conducting prostate cancer education and screening programs for high-risk populations. Hockey Fights Cancer’s contribution to the Pancreatic Cancer Action Network will be used to co-sponsor an innovative research grant, which supports cutting edge research in pancreatic cancer. In addition, Hockey Fights Cancer will distribute $10,000 to each NHL club to support local cancer organizations in their respective markets. For the first time ever, fans can now donate to the cause via mobile phone. Starting today, U.S. residents can text HFC to 90999 to make a $5 U.S. donation to The Leukemia & Lymphoma Society. Canadian residents can text HFC to 45678to makea$5 CADdonation to the Canadian chapterofThe Leukemia & Lymphoma Society. A one-time charge of $5 U.S. or CAD will be added to the donor’s mobile phone bill. Message and data rates may apply. join the fight with a busy month of events and activities. Each NHL® club will designate one home game as its Hockey Fights Cancer Awareness Night. Events will include on-ice presentations, 50/50 raffles, promotional giveaways, contests and discount ticket offers. Arena suites and tickets will be donated to children’s hospitals and cancer-affiliated programs, and young patients will be involved with in-game opportunities - including rides on the ice resurfacer, puck-drops, radio booth visits and player meet-and-greets. There also will be on-line, live and silent auctions of signed items including helmets, sticks, jerseys and other team merchandise. Several clubs will continue to promote awareness by participating in local hospital visits and fundraising runs and walks. Lavender, which represents awareness for all cancers, returns as the designated color for this year’s initiative and will be worn by the hockey community throughout October. And back by popular demand is the commemorative Hockey Fights Cancer tie. The dark lavender tie is custom woven, 100% silk with stripes and featuring an embroidered Hockey Fights Cancerlogo throughout. The tie, manufactured by Fairway & Greene, also features a custom woven Hockey Fights Cancer label. NHL coaches, broadcasters and team personnel will wear the commemorative tie during all regular-season games in October and players will wear a Hockey Fights Cancer decal on their helmets. In addition to the commemorative tie, fans of all ages will have a wide assortment of one-of-a-kind apparel and products to purchase in support of Hockey Fights Cancer, including ladies' track jackets and men’s caps by Reebok; ladies' caps by New Era; men’s, ladies' and kids' tees by Old Time Sports; and the NHL® Dream Capsule by UPI Marketing. Rounding out this year’s catalog is Best of the Decade: Reflections of Hockey's Past Ten Years, the fourth book is an annual visual celebration series, published by the NHLPA and the NHL, together with Getty Images, NHL Images and Greystone Books. This edition chronicles the highlights and candid, behind-the-scenes images highlighting the NHL's first ten years of the new millennium. Starting October 1, the commemorative tie, jacket, caps, book, t-shirts and NHL®Dream Capsules will be available at shop.nhl.com, select team stores and the NHL Powered by Reebok store in New York City. Copies of the book autographed by team captains will be auctioned on nhl.com and nhlpa.com in mid-October. A portion of the proceeds from the sale of all these products will benefit Hockey Fights Cancer. Hockey Fights Cancer™is a joint charitable initiative founded in December 1998 by the National Hockey League and National Hockey League Players’ Association. It is supported by players, NHL member clubs, NHL alumni, the NHL Officials’ Association, professional hockey athletic trainers and equipment managers, corporate marketing partners, broadcast partners and fans throughout North America. The goal of Hockey Fights Cancer™ is to raise money and awareness for national and local organizations involved in cancer care and research. To date, Hockey Fights Cancer™ has raised more than $11 million. Hockey Fights Cancer™is a component ofThe Biggest Assist Happens Off The Ice™, the National Hockey League’s® and National Hockey League Players’ Association’s social responsibility program that builds on hockey’s long-standing tradition of addressing important social issues in North America and around the world.